We have a wide variety of fine fabric and full grain leather upholstery available, and you can select the upholstery for your custom bench that is appropriate for your home décor. 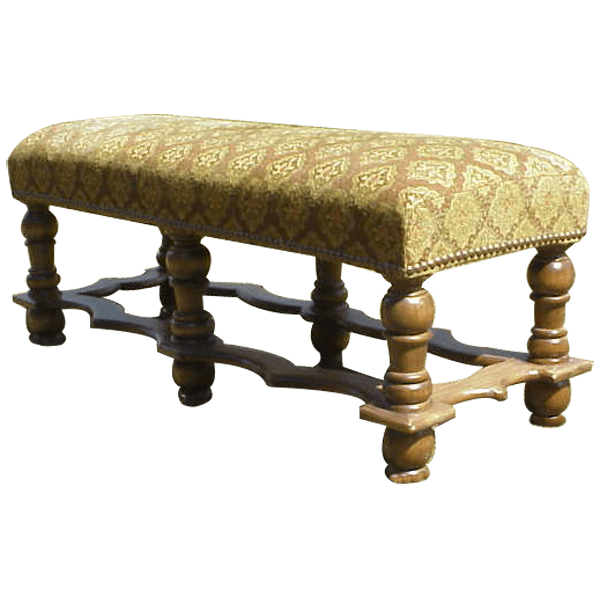 This handcrafted, Spanish colonial style bench is designed without a back, and its well padded seat is upholstery with lovely, patterned, fine fabric. The fabric is hand tacked to the solid wood frame with decorative, gilt nails. The bench is supported by six, beautiful, hand turned legs, and the legs are connected by a Spanish colonial style, silhouetted framework. It has an elegant finish, and it is made with the best, sustainable, solid wood available. The bench is 100% customizable.